Over the last several months, we’ve seen a slew of casino game launches from indie developers to the behemoth in the room, Zynga. The issue is that while it’s easy to create a casino-style game, it can be difficult to monetize one because of very fragmented and complicated regulations around online gambling globally. Enter Betable, a social betting company that’s being reborn as a platform for social game developers to add real, working gambling mechanics to their games. It’s backed by an enviable slew of investors including Greylock, CrunchFund, Yuri Milner’s Start Fund, Founders Fund, True Ventures, Path co-founder Dave Morin, former Wikia CEO Gil Penchina, Delicious’ Josh Schachter, StockTwits’ Howard Lindzon and LOLApps former CEO Arjun Sethi. The company’s not disclosing the amount of funding for competitive reasons. While Betable’s technology can’t work in the U.S., where online gambling is restricted, it can work in other countries like the U.K. Betable has gone through the trouble of obtaining the necessary licenses in big markets in Western Europe and parts of Asia. All told, the company’s chief executive Chris Griffin says those international markets make for a $32 billion online gambling market, compared to the current $3 billion social gaming market. Betable’s platform identifies which players they can legally show gambling-like features to based on their location or jurisdiction. So a developer that integrates Betable shouldn’t be concerned with exposing gambling mechanics to U.S.-based players, for example. He believes there’s a big opportunity because traditional gambling companies haven’t caught up with the last five years of development in the free-to-play and social gaming world. Some companies have stepped up, like Caesars, which acquired Slotomania-maker Playtika last year. The company’s in private alpha with 30 developers at the moment and they’re not disclosing the revenue share just yet. 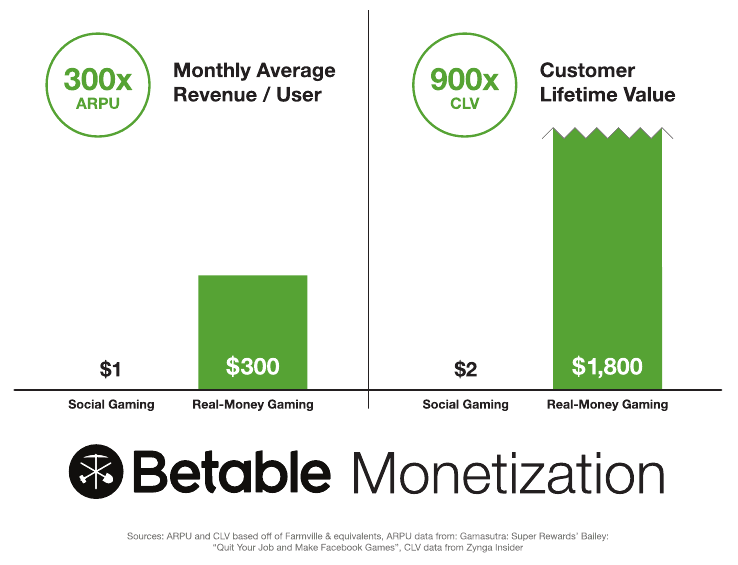 One other benefit of gambling-style games is that they tend to monetize far better on a per user basis, bringing in $1,800 in customer lifetime value versus $2 for social games, Griffin said. Online gambling businesses may also face lower tax rates in the 15 percent range, compared to normal business taxes as international territories compete on having the loosest regulations to attract companies. The issue for most developers is that it’s very painful to go through and get gambling licenses in all of these territories. The wait can be 18 months long, no matter how big a company you are or how much money you throw at lawyers and the problem. In the process of getting those licenses, Griffin said he discovered this opportunity to be a platform for social games that integrate gambling. He pivoted, bought the old investors out and recapped the company. How did Griffin buy his old investors out? “With a lot of skill,” he said, declining to reveal more. It’s worth noting that the company’s original lead Atomico Ventures, did not participate in this round. The company has offices in London and San Francisco.